Falsified letters, plots, and lies. The Church in Peru is at war. The target is the archbishop of the capital, the first Opus cardinal. And he´s fighting back. ROMA – A taboo was overturned last June 15, the one that forbade Opus Dei from having one of its own bishops in Spain. The nominee is Jaume Pujol Balcells, new bishop of the diocese of Tarragona. It was Paul VI who established the prohibition during the 1960´s, with his trusted nuncio in Madrid, Giovanni Benelli. Spain is the birthplace of Opus Dei, but in the view of pope Giovanni Battista Montini, a Spanish bishop for Opus would inevitably have created too much division. The organization founded by Josemaría Escrivá de Balaguer seems destined to be either loved or hated too much. Even with Pope John Paul II – who has great respect for Opus; he made it a personal prelature and canonized Escrivá – it took twenty-five years to get approval for their first bishop in Spain. In compensation, Opus Dei has long had a good number of its bishops in Peru. There are presently seven of them there. 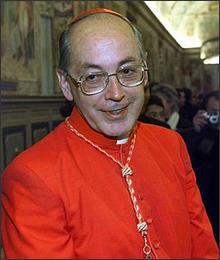 In 2001, one of them was made a cardinal: the archbishop of Lima, Juan Luis Cipriani Thorne, 61 (in the photo). But judging by what has happened to him, Paul VI was right: Opus cardinal Cipriani has landed squarely in the center of an explosive disagreement among his admirers and detractors. And the aftershocks reach all the way to the Vatican. Cipriani is popular in Peru. A recent poll found his approval rating to be at 52 percent, against a miserable 8 percent for the current president, Alejandro Toledo. But things are different in the higher echelons of politics, culture, and especially the Church. Here the attacks against him are ferocious. In a July 11 interview with John L. Allen, Jr. of the “National Catholic Reporter,” Cipriani listed one by one the attacks of which he has been victim. And he counterattacked by accusing other bishops, and even, to a small extent, the Vatican. Fresh venom came along in 1997. Terrorists of the group Tupac Amaru took hostages at the Japanese embassy in Lima. The ordeal lasted four months, and Cipriani was the principal mediator between the terrorists and Peruvian president Alberto Fujimori. The bishop was accused of putting himself on show, of bringing spy equipment into the embassy, of playing the double game. It all finished with an armed assault during which 14 terrorists were killed, and Cipriani was blamed even for this. Third accusation. In 1999, Cipriani was promoted to be the archbishop of Lima, and there were rumors that he had collaborated in the assassination of his predecessor, Jesuit cardinal Augusto Vargas Alzamora, who died of a cerebral hemorrhage. Fourth. In 2000, secretary of state Angelo Cardinal Sodano received a letter on official stationery, and apparently signed by Cipriani. It accused of immoral behavior two bishops who have since died: the auxiliary of Lima, Alberto Aurelio Brazzini, and the former archbishop of the capital, Juan Landázuri Cardinal Ricketts. Cipriani notified Sodano that the letter was false, including the signature, but at the secretariat of state they hesitated to believe him, and during the bishops´ synod in 2001, while he was in Rome, they subjected him to an embarrassing interrogation. Fifth. Again in 2001, the Peruvian justice minister at the time, Fernando Olivera, came to Rome asking to meet with the substitute secretary of state, Argentinian Leonardo Sandri, and showed him three letters seeming to prove a plot between the authors and the ill-famed former head of Peru´s security forces and president Fujimori´s henchman, Vladimiro Montesinos, who is now in prison. The first letter seemed to have been signed by Cipriani, and it asks for the “elimination and incineration” of secret videotapes that show him with Montesinos. The other two bore the signature of the Vatican nuncio in Lima, Rino Passigato, believed to be one of Cipriani´s supporters: the letters thank Montesinos for a contribution of 120,000 dollars and ask him for more money. In reality, these three letters were also false. Cipriani and the nuncio attested to the fact, and the government also admitted it. A judicial investigation of the affair was opened. And Cipriani says he hopes that justice will be done and the guilty parties found. He told Allen he is “completely convinced” that “there are bishops involved,” that the sheets of paper used “were in the national [bishops´] conference” and “we know who took them away.” As for his counterfeited signature, he says that the hand of the forger is the same for the letter to Montesinos as for the one that Sodano received earlier. Cardinal Cipriani doesn´t name names. But it is known who the bishops are in Peru who are most opposed to him. The most visible is Luis Armando Bambarén Gastelumendi, 76. Until a few months ago he was the bishop of Chimbote, and he has been the president of the bishops´ conference. He is a Jesuit, and thus a traditional enemy of Opus Dei. Moreover, he belongs to the movement of liberation theology, which is the polar opposite of the conservative strain personified by Cipriani and by Opus. Liberation theology was born in Peru, with the book “A Theology of Liberation,” published in 1971 by Gustavo Guttierez, and since then it has split the Peruvian Church down the middle. Guttierez, who lives in Lima, became a Dominican friar in 1999, a few months after Cipriani´s nomination as archbishop of the city, and spends part of the year teaching in the United States. His being a Dominican gives him more autonomy than he would have had as a diocesan priest. Cipriani makes no mystery of considering him as “faking” Dominican, with the sole purpose of evading his control. One of Cipriani´s other implacable enemies is the archbishop of Trujillo, Héctor Miguel Cabrejos Vidarte, 66, a Franciscan. Having become a bishop very early, at just 39, he was an auxiliary of Lima and of the military chaplaincy, and does not hide his ambition of becoming archbishop of the capital. He comes to Rome frequently, and has connections at the Vatican. He gives them alarming accounts of the ruptures in the Peruvian hierarchy, provoked, according to him, by Cipriani. The aim of Cipriani´s enemies is his removal, perhaps by nomination to a post in the Vatican. But if their method is that of discrediting him personally through false letters and unlikely accusations, it is more probable that this will backfire against its authors. The judicial investigation into the letters is underway, and could set off a mini Watergate in the Peruvian Church. On Cipriani´s side are, naturally, the other bishops of Peru belonging to Opus Dei. These are the archbishop of Cuzco, Juan Antonio Ugarte Pérez; the archbishop emeritus of Arequipa, Luis Sánchez-Moreno Lira; the bishop of Chiclayo, Jesús Moliné Labarte; the bishop of Abancay, Isidro Sala Rivera; the bishop of Chuquibamba, Mario Busquets Jordá; and the auxiliary of Ayacucho, Gabino Miranda Melgarejo. One more will soon be added to these: the new bishop of Yauyos, a prelature that is now vacant, and which has been assigned to Opus for 47 years. Go to the home page of www.chiesa.espressonline.it/english, to access the latest articles and links to other resources.